Well look at that! Those too old, too soft, too European Red Wings are at it again with their uncouth goon behavior. Do those in Detroit not know that North American fans want clean, no touching, skill sessions and puck possession; they never call that boring hockey. It’s not like some movie about goon hockey, even named Goon, was top of the box office in Canada recently. That stuff just is not part of the North American culture of the game. Oh… well… Alright so the Detroit Red Wings may not be as soft as some seem to think; but they are old. Captain Nicklas Lidstrom will be 42 this spring and there is no way he can keep going at the pace he is; no over forty player … oh forget that Teemu Selanne out in Anaheim. Fact is players that take care of themselves, never take a day off even in the summer, and have the skill can play into their forties; and these guys played in an era of goon hockey. Niklas Kronwall becomes public enemy number one whenever he lays a huge hit on a guy. Why? Because he is not one to drop the gloves after a hit? Because he is a Swede? Or is it that hockey culture is so messed up right now they do not have a clue how to react? Years ago players were told to keep their head up. Are they not taught that anymore? It use to be fighting was a way of policing the game, making sure other tough guys did not take unnecessary runs at guys like Wayne Gretzky or Steve Yzerman. Nowadays I feel as though if a player looks at another one wrong they are going to be expected to drop the gloves. Don’t be getting me wrong now; I don’t want to see fighting removed from hockey. I just don’t want hockey to become a MMA fight. If I wanted to watch MMA I would. First thing I taught my daughter when she got her first pair of skates (even before she was allowed to take them on ice) was to keep her head up. Kronwall has 109 hits this season (at time of writing) and really only two recent ones against the Flyers have pulled in any press (well except for that night in Columbus when the Red Wings only managed to put two hits on that highly skilled in evasive maneuvering Blue Jackets team in 60 minutes of play). 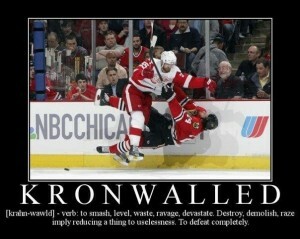 Why is it only news when Kronwall lays a big hit on an Eastern Conference team? Why not give some of the Western Conference players he has hit some time in the spotlight? Where is the outrage at Washington Capitals defenseman Mike Green? There are some post about this out there, 8 hours ago, 19 hours ago on his hit last night on Tampa Bay Lightning‘s Brett Connolly. Green is set for a diplomacy hearing; but where are the Twitter tirades from fans about going to DC and wanting to beat up Green the way Flyers fans were discussing on Twitter after his hit on Jakub Voracek? If Kronwall’s hits are always illegal, always so devastating, so much of a goon than why have the players not learned to keep their head up when they play Detroit and he is on the ice? Remember the 2009 playoff run when Kronwall got the term Kronwalled coined after he laid out then Chicago Blackhawk Martin Havlat? If you watch Havlat on the ice against Kronwall now, Havlat plays more reserved when Kronwall is on the ice. He learned the hard way to keep his head up (just has to learn how to jump over the boards without crushing his knee… baby steps Havlat baby steps). When it comes down to it fans will always be on opposite side of the debate on every aspect of the game. The same hit but in different eras will have a different take from a fan than it might in the game today. The game is constantly evolving and I am not going to compare Kronwall to Scott Stevens or any other hard hitter; Kronwall is Kronwall and he is a player in the NHL today. Love him or hate him he is part of the Red Wings leadership core.